A superb walk in Littondale visiting the fascinating area of Dowkabottom before heading on to climb Proctor High Mark and returning via Cote Gill. Dowkabottom is truly one of the hidden gems of the Yorkshire Dales. A great depression, almost like a hanging valley, Dowkabottom or Douky Bottom as it is also sometimes marked on maps, is today a very quiet place. Archaeological finds, particularly from Dowkabottom Cave, suggest however that humans habited the area fairly regularly from the Stone Age right the way through to Roman times. Situated high above Littondale there are no public rights of way anywhere near Dowkabottom though fortunately it is located on access land. Its difficulty of access can be said to be one of its great appeals and is the main reason why prior to this walk it had been almost ten years since I’d last been up there. On that occasion I’d explored the area with my friend (another Matthew) in thick hill fog. Whilst this added greatly to the atmosphere of the place it had been nagging away at me for a while to go and take a look around in better weather. Planning a satisfactory circular walk was proving something of a challenge and then one evening I came across Stephen Oldfield’s blog post on his caving trip to Dowkabottom Cave. Although the start of this looked a little bit trespassy I thought that if it is good enough for a published author then it is good enough for me! Therefore I used Stephen’s route to Dowkabottom as the start of the walk and then planned a route continuing on to the top of Proctor High Mark, one of the two 500m+ summits in the limestone uplands between Malham Tarn and Arncliffe in Littondale. The walk started on the road to Arncliffe just as the road crosses over Sleets Gill Bridge. Here there is just enough room to park a couple of cars carefully just off the road. To start the walk I hopped over the wall and walk head uphill with Sleets Gill, to your left. This is not a designated right of way though there is a trodden way which comes to an end at what seems to be a recently constructed barbed wire fence. Having carefully crossed the fence I took a look at the deep entrance to Sleets Gill Cave. Descending at an angle of almost 45 degrees only experienced cavers should enter. Even after a dry period the cave below is liable to flood. Having taken a couple of pictures of the entrance I took a thin path slanting up to the right. This then double backed sharply for a stiff climb up to the junction of a wall and fence. Crossing over this I zig-zagged up some scree to find a thin path climbing up alongside the wall. The gradient soon eased as the path swung right below the wall. In this area, even before reaching Dowkabottom proper are the remains of Bronze Age and Iron Age dwellings and enclosures. They are not always easy to spot but they are there. Ahead the weird and wonderful Dowkabottom cairns also appeared high above. Suddenly a red deer ran across the wall ahead of me. Every so often it would stop, look at me, make a weird barking noise whilst it hopped up and down and then run on a bit further. The thin path crossed a gap in the broken wall before climbing up to pass through a nick and enter a large shallow area rimmed with limestone crags and knolls. Passing to the left of a giant boulder the thin path climbed up to the corner of a wall. A former gap that once existed in the corner has been blocked with stones, just to the left however a kind of step stile provided an easy way of crossing the wall and to Dowkabottom. Dowkabottom Cave lies almost straight ahead though is at this stage unseen. Rather than making a beeline for the cave I took a grassy track to the right a short distance. Looking down a number of stone mounds could clearly be seen. What their origins are I’m not sure. To the north the cairns could also be clearly seen once again. Climbing half-left across limestone pavement I came to a large flat area where the outlines of the ancient enclosures marked on the map could clearly be seen on the ground. Passing the enclosures I next climbed up to visit the cairns. Interestingly these are not marked as ancient cairns on the map though their close proximity to the enclosures and settlements of Dowkabottom would suggest a connection. This almost unique collection of over 30 cairns can clearly be seen from the valley below. Situated so prominently on a high limestone shelf they seem to take on the aspect of a large group of people when viewed from below. Returning to the enclosures I walked south a short way to where the ground dips and to where Dowkabottom Cave can clearly be seen. Dowkabottom Cave has seen some remarkable finds including the buried remains of a small child. There are two entrance in the deep hole, the northern entrance requires use of a rope. I spent some time debating whether to take a look inside the southern entrance and indeed scrambled down to the entrance itself. In the end I decided that as I was on my own I should take the safety first approach and not risk it. However, for those who are interested in knowing what the cave looks like inside please do visit Stephen Oldfield’s blog. Returning to the wall I now turned right to follow a quad track with the wall on my left. Reaching a wall corner I turned right and continued with the wall on my left. To my right there was a great view of the shallow basin of Dowkabottom with the cairns on the skyline at the far end. There followed a pleasant walk on grass heading south-west. After passing through a few gates at some sheep pens there was a short climb and subsequent descent to another gate. Without passing through this gate I turned right climbing uphill to reach a final gate that brought me to within metres of the summit of Proctor High Mark. 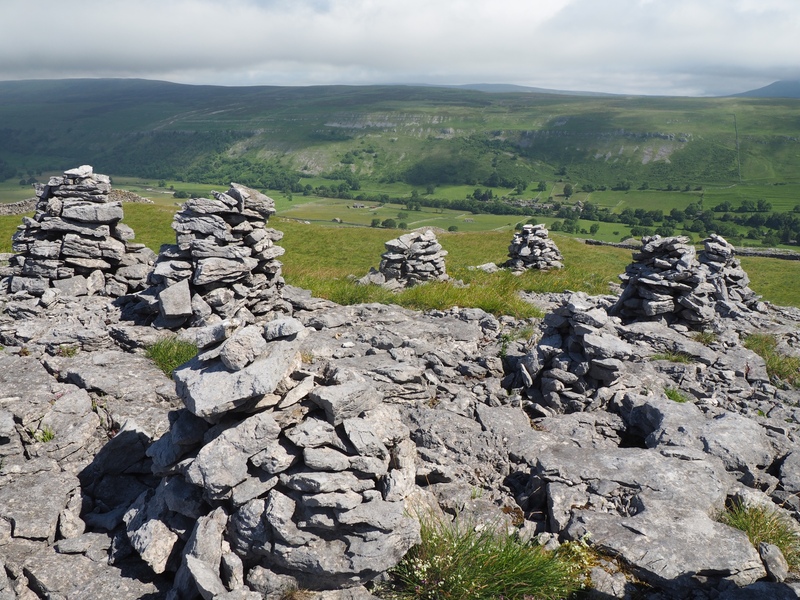 The top is marked by a small cairn and has good panoramic views that include Dales heights such as Rye Loaf Hill, Fountains Fell, Parson’s Pulpit, Great Whernside and Cracoe Fell. Pendle Hill in Lancashire could also be well seen, to the left of which was a great swathe of moorland in the South Pennines. A much finer spot than the summit cairn is a much larger cairn just to the south. On our first visit Matt and I named this the Wizbit Cairn as it has the same pointy shape as the titular character in the 1980’s children’s show. After sitting by the Wizbit Cairn I walked back across the summit to head north-east. Along the way I passed at least one of the lines of disused shafts that is marked on the map, a small tarn, a disused tip that looks like a shallow cairn and then a modest limestone scar. Just beyond the latter I reached a wall corner at grid ref SD933680. The corner was thick with nettles but just to the left a large boulder enabled me to climb the wall with little problem. On the small hill on the other side of the wall, called High Mark on the map, there were some unusual boulders including one shaped just like a toilet. Now heading in a more westerly direction with a wall to my right I eventually reached the bridleway between Street Gate and Arncliffe Cote. Turning right on this I began the long gentle descent back into Littondale. One particular pasture was full of cow and calves, the latter seemed to enjoy crowding round some walkers heading towards me on the path. Under normal circumstances I’d have given the calves a wide berth but seeing as the other walkers weren’t having any problems I bravely, for me, continued down the path. Having passed through a gate and crossed a side stream I made a detour from the bridleway to visit a waterfall that is not marked on the map. On my only previous visit it had been completely dry. At least on this occasion this 20ft plus fall had some water coming down it but I’d still like to see it in full flow. Climbing back out of Cote Gill to the bridleway it was then a simple walk down to Arncliffe Cote enjoying increasingly good views of Littondale along the way. Once at Arncliffe Cote I turned right along the road a short distance before turning left on the the very narrow Out Gang Lane. Following this all the way to Hawkswick Bridge the walk concluded along the path passing the ruin of Scar Gill Barn and another short stretch of road walking. Despite the almost unavoidable cows and the necessary wall climbing this was a magnificent walk. Dowkabottom really is a wonderful place and the rest of the scenery, especially in Cote Gill was also very fine indeed. One of my favourite walks of the year.